For years, I have debated over buying bedding pieces that are a ‘splurge’ and may last a long time vs. something less expensive that may or may not go out of style in a few years, but satisfies my need today. If you’ve been around for a while, you know that I’m a Target lover, so naturally a lot of my bedding comes from there. Actually all of the bedding that was on our bed, that’s in the guest room and our little girl’s room right now is from Target. You just can’t go wrong! But it was time to switch things up in our bedroom. I finally decided I was ready to splurge on some new bedding. Because everyone has a different taste/style, I’m going to share what I have along with some similar items. First, let’s look at what’s on our bed. Right now, I’m sticking with a classic grey and white theme. I may switch out pillows every now and then (like adding a pop of color of pink below), but so far I’m liking this simple look. First, let’s talk about the duvet. The most important part of the duvet cover is a good insert. We have a queen bed, however, I bought a king insert. 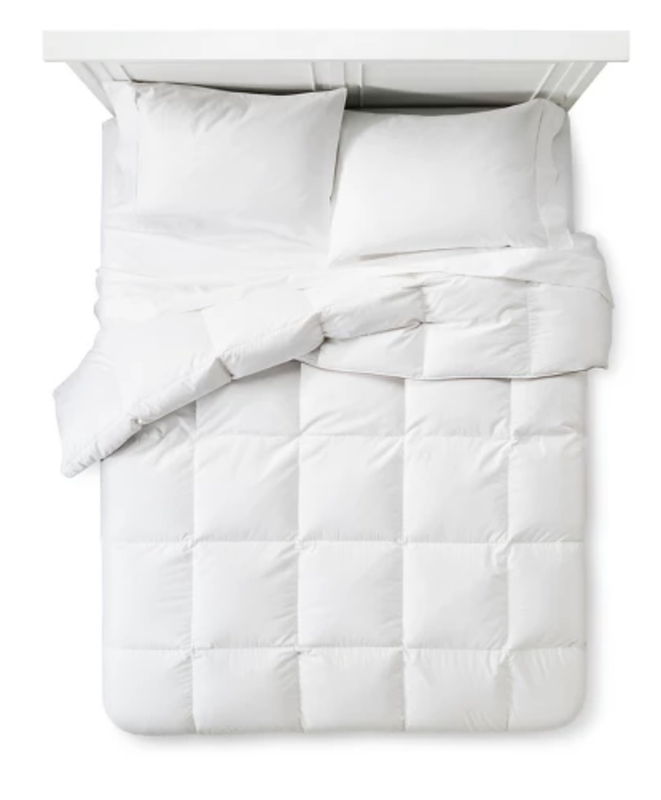 The bigger insert fills the queen duvet cover and makes it fuller! The duvet cover I bought has ties and the insert has a spot on each corner for you to tie it to so it doesn’t move around. The duvet is a linen duvet and it’s even more beautiful in person. I love to fold it at the end of the bed so that you can see some of the white quilt at the bottom. I LOVE to have a lot of pillows on the bed. On our bed, we have 4 pillows we sleep with (2 each) and then two standard shams. Also, the striped pillows are 22 x 22 and the pink pillow is a euro sham. 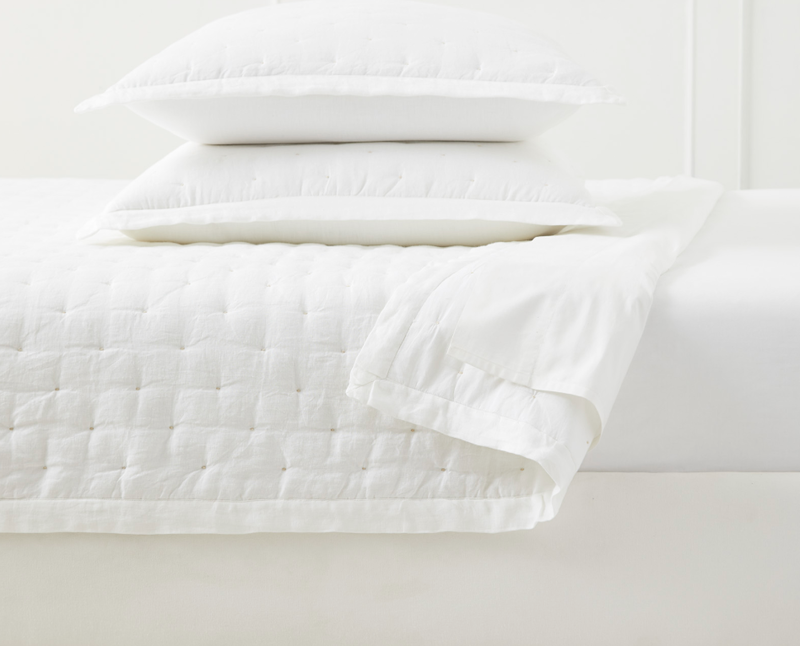 I LOVE the look of linen bedding and the quality is great. It keeps us warm, but it’s also super breathable. It’s definitely an investment to buy linen pieces, but I decided it was time! I know what you’re all thinking..
What actually stays on the bed when you sleep? Of course we remove the stripe pillows and shams. I just place the extra pillows on the floor next to the bed and then put them back on the bed each morning. The duvet usually stays at the foot of our bed. When it’s really cold, we use it to cover up with, otherwise, it stays in place and helps keep the rest of the blankets in place, too! If you’re interested in the bedding/decor in my daughter’s room or other nursery projects, find all of the details below. Older PostFriday Favorites: What's in my Target cart!